Sometimes you just need a little something sweet. Friends or neighbors stopping by? Late night and no dessert in the house? Feels like a milk-and-cookies afternoon? These cookies have you covered. They’re quick to make, but try to let them cool for a few minutes after they come out of the oven. You’ll be rewarded with a crispy edge to contrast with the rich, chewy, nut-studded center. You can choose to add a bit of chopped bittersweet chocolate to this dough, of course. And chocolate is always good in chocolate’s own way, but omitting the chocolate really lets the hazelnut flavor shine. Or–go crazy–make them with another nut, your favorite. (What IS your favorite? I have a hard time deciding.) Whatever you choose, you’ll want to use good nuts here, so taste them before you buy them if possible. Here in Seattle, I buy Holmquist Orchards Dry Roasted Hazelnuts at my farmers’ market. They’re also available at the Pike Place Market (every day except Tuesdays) and by mail. 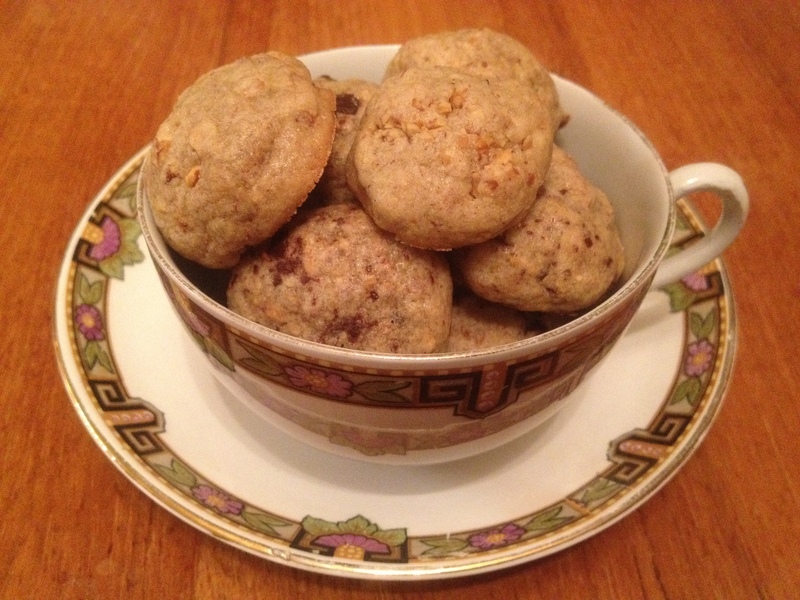 Hazelnut Tea Cookies: Cream a stick of butter (or 7 Tb. butter and 1 Tb. roasted nut oil, to match the nut you’re using) with 3/4 c. light brown sugar. Beat in 1 egg, 1 tsp. vanilla, and 1/4 tsp. salt. Slowly stir in 1 1/4 c. flour, then 1 c. finely chopped (or coarsely ground–I pulsed them in my food processor) hazelnuts. Roll dough into 3/4″ balls and bake at 375 until lightly browned on top and more deeply browned on the bottoms, 8-10 minutes. Cool on a rack. Optional: dust with powdered sugar. Recipe from Deborah Madison’s Vegetarian Cooking for Everyone, of course. And now that you’re thinking about cookies…. This entry was posted in Baking, Cookies, Desserts, Easily Multiplies to Feed a Crowd, Feeding Kids and tagged baking, children, cookies, cooking, dessert, DIY, family, food, homemade, kids, lifestyle, recipes on March 24, 2012 by emmycooks. The weather has turned cool here in Ontario (Canada), or I should say we now have more seasonal weather after a freakish, yet delightful, hot spell. These cookies sound so good for a Spring day! Just the thing to nibble on tonight while watching the season opener of Mad Men. I made these cookies for my Easter dessert offerings, and they were very popular. Two guests asked for the recipe. I’ll be blogging about these soon, with a link back to your post of course! Alas, they’re all gone now, in part because one of my daughters took a lot home with her. She has two babies and needs all the cookies her mother can make for her! I love hazelnut! I will have to try these cookies soon. I never thought I loved hazelnuts until I moved to the Northwest and started tasting them at farmers markets. They are like a different nut compared to the ones I’d had before. I’m a convert! These look delicious! I love hazelnuts and chocolate together (our most eaten chocolate bar is Ritter dark with whole hazelnuts) – a wonderful looking cookie! Oh beating heart! Hazlenuts are my absolute favorite. I also think the idea of using a roasted nut oil that matches the nuts in the cookie is a stroke of genius. I can just think of walnuts or pistachios. Seeds too, maybe? Sesame? Pumpkin? In any case, these cookies look great. And why am I not surprised that the idea comes from Deborah Madison? Isn’t the nut oil idea a good one? I haven’t tried it because the only time I bought a nut oil I let it go bad after using 3 Tbsp. I think it’s time to try again, though. I LOVE the idea of using sesame seeds and sesame oil, I will definitely be trying that. I have been perusing recipes for tahini cookies lately, but maybe a variation on this recipe is the way to go instead! That happens to me too! I end up storing nut oils in the fridge, but even then I feel like I have trouble making it through them before they go. I have been moving through pumpkin seed oil at a fast clip though ever since I read that it’s a good topping for vanilla ice cream. Seriously. It’s amazing. No joke! I love, love, love hazelnuts. (Only nuts that equal them for me are macadamias.) Must try this recipe. Thanks for posting.